For the most part, Saturday market time is Me Time. C is out mountain biking in, oh, some mountain somewhere. Little C is asleep or playing with the nanny. Weekend activities have yet to start, or even be planned. It’s a quiet pocket of morning that is all mine. Going over the fresh produce, seeing the new offerings from our local farms, chatting with the purveyors, (tasting all the free samples! ), finding something to take home for breakfast. I walk to my neighborhood weekend market with my bags in tow. If it looks like rain I take my battered umbrella (a fake-y Barca one we had to procure on our honeymoon during a rainy jaunt to Cadaques). The walk in itself is a time for reflection (and probably the only exercise I get every week…I know, don’t even say it). A gentle reminder to be grateful for the blessings in my life, both big and small – my family, a market that is a short walk away, coffee, hot showers & cold sheets, warm soup on a rainy night. And all the artisans and experts, the zealous and new, along with the experienced though still as fervent, that cross my path. One of my favorites is a pair of Chinese ladies who make and sell homemade dim sum and noodles. They man a small table brimming with siomai, wontons, kikiam, fresh noodles, lobster balls, XO sauce, and all sorts of things I want to make off with. The dim sum is frozen so you can keep some stored away in the freezer for emergency wonton noodle soup. – Cook the egg noodles as per package directions and set aside. – Place stock, ginger, and onion in a pot and bring to a simmer. Simmer until the onion is soft. – Add the wontons into the pot and simmer for about 5 minutes. Add bok choy and mushrooms and simmer a further 5-10 minutes or until everything is cooked. – Add a splash or two of soy sauce to taste. Take the pot of the heat. – Pile noodles in individual bowls. Pour soup over the noodles making sure each serving gets some vegetables and wontons. Garnish each serving with sliced green onions. This soup hits the spot on a rainy night after a tough day of work when you both want something homespun and nourishing, but at the same time don’t have the energy to prepare anything too involved. It’s all a matter of getting your noodles done, and, at the same time, putting everything in another pot to cook. We like it with some chili oil or chili-garlic oil (the type you have with siomai) drizzled on top. The volumes are far from specific as you can add as little or as much as you want (or you have). Switch the enoki with shitake or add more fresh herbs to garnish — you can get as fancy or as bare-bones as you want with this. This version, as the title implies, is very basic…great as is but also good to build on. Until I finally attempt making my own wontons, my two ladies have got me covered. Recipe suggestions are very welcome though! Love! I must get some of these wontons. And Me Time is definitely a necessity to keeping one's sanity. I hope to see you soon!! Oh I'm so jealous, you live within walking distance to a weekend market? I have to brave edsa to get to one! Love your recipe for the noodle soup, the picture is making me crave for one right now, it looks so delicious! Oh those wontons look so so good! Even better than the one's I've had in Hong kong! I absolutely love this dish. I guess it's because of our ties to HK that these noodle soups is at the top of my comfort food list. I make this all the time at home and it definitely hits the spot when the chill of fall and winter comes rolling in. A true HK-bred girl like me often craves for wonton soup on a rainy night like this! I'm gonna whip me up some of this tomorrow after my grocery run. Hi Iyor! They have other things as well, like siomai and homemade noodles! 🙂 See you soon! Hi Mieke! HK! That's where we first met 🙂 I agree, this truly is a comfort, especially when it is cold or rainy out! Hi Martine! Didn’t know you lived in HK! Hope you enjoyed the soup! I'd love to run over to the Salcedo Market this weekend to sample those dumplings for myself, but alas, I'll be in QC! Still, that soup looks incredibly delish. Cheers, too, to classic comfort food! Wonton soup ALWAYS hits the spot for me. Just like chicken noodle soup and arroz caldo… Enjoy the long weekend! Hi Arlu! That is so true! That was a great lesson I learned when I was working out of the country and had to spend a lot of time alone 🙂 Arroz caldo is another one of my favorites…so healing! Totally agree with the "me" time! With Good Food, home massages, watching nice movies/plays, cool music, a good book,etc-such bliss! I am so happy I found your blog – and this recipe! 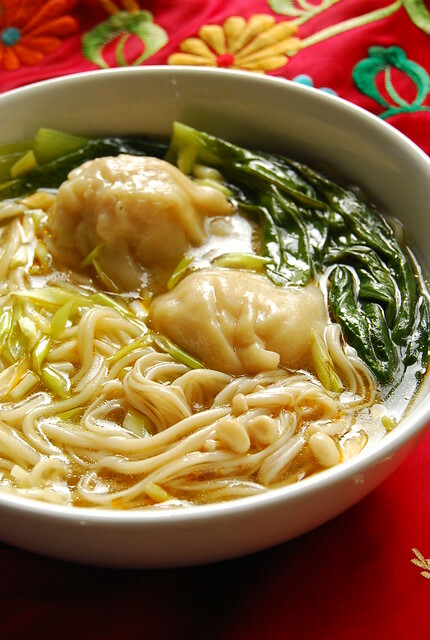 I've been looking for a quick-fix wonton soup and this will fit the bill! Thank you for the inspiration! When I don't feel well I always skip the chicken noodle and go straight for the wonton soup. Thanks for the ideas! This looks delish! Can't wait to make us some! Time for Simple Wonton Noodle Soup for breakfast. Great site. Thanks for sharing your delicious food with us. Comfort food chinese style! Mmmmhhhmm! I have similar ingredients in the pantry right now. Will be making this when I stand up. Looks very good and I bet it is.